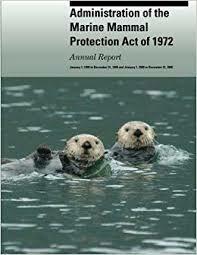 Research papers drawn up on the Marine Mammal Protection Act overview the Act itself or the ramifications of the Act on the marine population, fishermen or the environment in general. Paper Masters custom writes all oceanography projects at the Undergraduate and Graduate levels. The total number of dolphins being killed as a result of tuna fishing was still significantly high. Dolphin-Safe Tuna Labeling Act was one of the many responses to concerns about tuna-fishing practices in which fisherman encircled dolphins with their nets frequently entangling and killing dolphins. Long before tuna labeling, Congress had enacted legislation to help prevent the senseless death of dolphins that occurred during tuna fishing. In the late 1980's consumers, frustrated by the government’s inability to control the rapidly decreasing dolphin population, began boycotting companies that sold tuna caught by fishermen who did not practice dolphin safe fishing practices—typically companies that bought their tuna from foreign fisheries. In response to this boycott, in the 1990's, President Clinton signed legislation that officially defined “dolphin-safe.” Companies that canned tuna could label their product as dolphin-safe if it met the government’s standards. Marine Ecosystems - Marine Ecosystem Research Papers look at chemical defenses that help defeat the efforts of herbivore attackers. War Powers Act - War Powers Act was adopted in 1973 after the Vietnam war, limiting presidential military authority. Paper Masters writes custom research papers on Marine Mammal Protection Act and show how the act preceded the Dolphin-Safe Tuna Labeling Act.